I can not tell shapes from the pictures but they look beautiful! Please let us know when they are done! Oy. This looks like a load of work - but a very satisfying one, I'd say! Time out from an uncooperative WIP is always good! dazzling! what amazing pictures! It gets my magpie juices flowing- I just want to put them in my pocket! 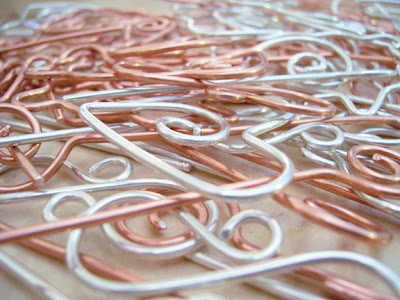 I'm in lust ... the copper pins are especially lovely! Wow, those look amazing. You must have spent a lot of time of those! The pins are amazing! I'm sure the mohair will realize the error of it's ways soon enough. Rosemary-I would have a hard time finding a shawl worthy of such gorgeous pins. I like the silver and the copper. I hope you and your mohair come to an understanding. I'm so happy for you for being able to do what you love like that. What a blessing! Your shawl pins are on my wishlist! Looks like a lot of work but I bet it is fun work! I will have to buy a pin of yours when I get some extra money. I think they are very pretty. Love those pictures! 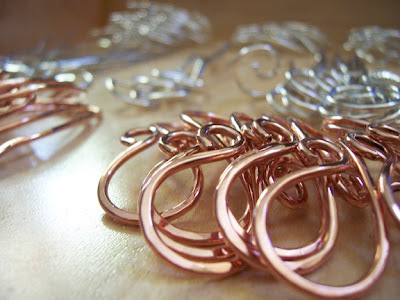 One of those charming copper figure 8s is on its way to me via one of your retailers. I hope the mohair is learning its lesson. Those are beautiful shawl pins! I don't know how to use one, but then, it will probably be another decade before I finish my first shawl. Sorry about the mohair. I find a good timeout works wonders in bringing unruly yarn under control. That top picture is really cool! Beautiful, beautiful pins. Those pictures are breath taking! You are a wonderful artist. I agree that this looks like a lot of work! And, bad mohair -- BAD, mohair! Talk about making order from chaos! Holy moly! I think you will be the KIC (Knitter In Charge) when you get back to that bad mohair! You can easily catch up to me on Peacock -- I had to rip back to my lifeline! I'm finally back to row 205...maybe we'll finish at the same time. Gee, I love your pins. A wholesale order, good for you! Wow, that looks like an amazing amount of work. All nice and shining. Mohair frequently needs timeouts. I think it's genetic. Time out is just what you needed! Those shawl pins are beautiful. I just ripped back a bunch of mohair on a shawl....I feel your pain. That looks like a huge order! I love the curve that you put in your pieces. Very nice! Hope that naughty mohair stops acting up soon.